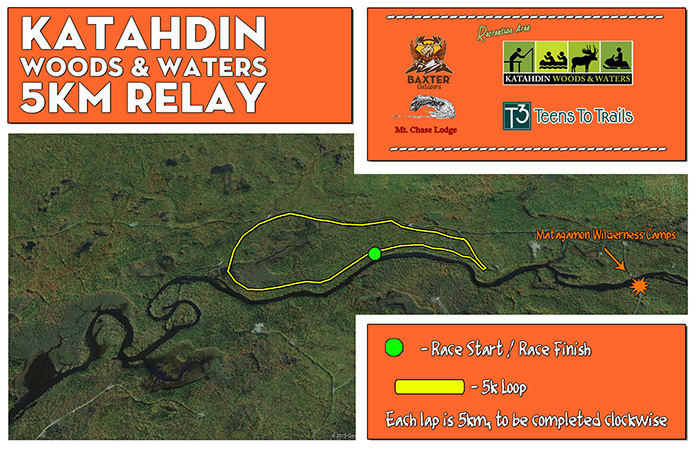 Welcome back for the fifth running of the Katahdin Woods and Water 5k Relay! Deep in the Katahdin Region of Maine, this 10km gem takes place where dirt roads cease and true wilderness begins. The course weaves through the pristine wilderness for over 3 miles. It is isolated, it is quiet, and it is beautiful. A perfect venue for a Baxter Outdoors race. The 5km loop course will take place mostly on dirt logging roads. 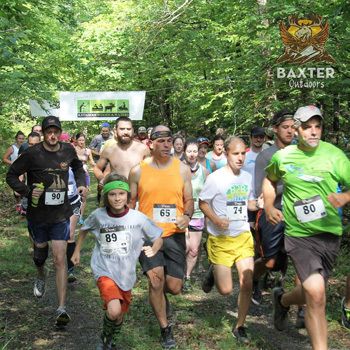 This race is part of the 'Wild Maine Weekend' hosted by Mt. Chase Lodge. The event's Facebook page has information on the event. There will be a live band and BBQ that evening following the race, at Mt. Chase Lodge! 100 yards past the Matagamon Wilderness Store & Camps (near north entrance to Baxter State Park) - Travel on I-95 to Exit 264; turn west (left) on Route 158 which shortly joins Route 11. Bear right on Route 11 and travel 9 miles to Patten. Leaving Patten, turn left on Route 159, the Shin Pond Road. Continue 26 miles on this road to the Matagamon Wilderness Store and Camps. Katahdin Woods & Waters Recreation Area can be accessed just beyond the camps on the left. **Please show up no later than 9:15am for a 10:00am shotgun start. Parking for this race will take place just prior to the National Monument entry gate. The start/finish is a .7 mile walk from the parking area. The path is signed with arrows. Those not looking to walk, may park at and take a shuttle from Mt. Chase Lodge. This shuttle, however, will not depart the race area until about 12pm, so plan accordingly. *In the instance of the race being canceled due to an act of god (blizzard, hurricane, etc) a refund will not be issued. This is very unlikely. We have never canceled a race. This race is designed for all abilities. While it is quite isolated the terrain is very flat and smooth. All participants may deal with heat and humidity depending on the weather. As with all trail runs, beware of rocks, roots, and mud throughout the course. Racers looking to walk will enjoy beautiful scenery and easy hiking terrain.